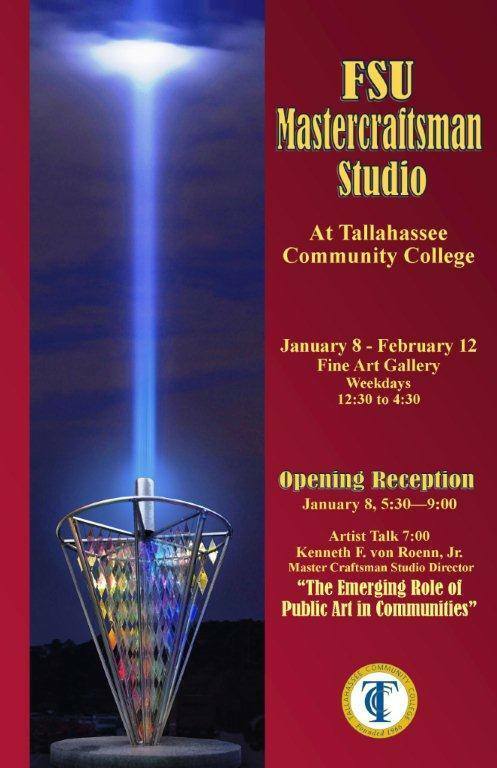 Department of Art | FSU Art Students and Faculty in 1/8/15 Retrospective Exhibition "FSU Mastercraftsman Studio"
Home » News » FSU Art Students and Faculty in 1/8/15 Retrospective Exhibition "FSU Mastercraftsman Studio"
FSU Art Students and Faculty in 1/8/15 Retrospective Exhibition "FSU Mastercraftsman Studio"
Tallahassee Community College is featuring the work of Master Craftsman Studio from January 8th – February 12, 2015 in the Fine Art Gallery. Please join us for a special Opening Reception, Thursday, January 8th from 5:30 – 9PM with an Artist’s Talk by Kenneth F. von Roenn, Jr on The Emerging Role of Public Art in Communities. This retrospective show covers everything from our earliest work to the City of Tallahassee’s newest public art installation, Declaration as well as work from the personal studios of Phil Gleason, Juan Comas, Lyrica Peterson, Zak Weinberg and Scott Bell.